This defense will keep Wyoming in every game they play. 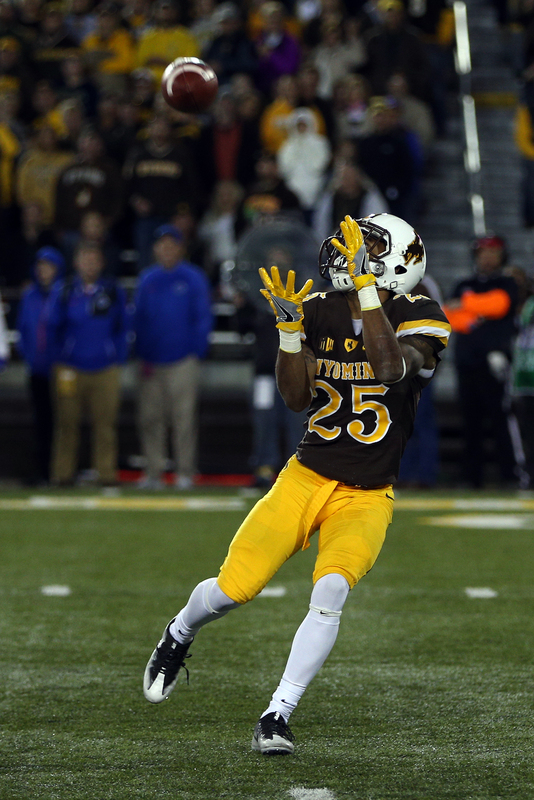 It’s no secret that the 2018 Wyoming Cowboys’ strength is their defense. Wyoming returns 8 of their 11 starters and a number of guys that played significant time from a defense that led the nation in turnovers a year ago and have started to draw national attention. They are littered with NFL talent on every layer of defense. The defensive line will be spearheaded by senior defensive end Carl Granderson (77 tackles, 9.5 sacks, 2 ints in 2017) and junior DT Youhanna Ghafain (69 tackles 15.5 TFL, 7 sacks). Behind these two, guys like Sidney Malauulu, Garrett Crall, Josiah Hall, and Kevin Prosser make the DL one of the best and deepest in the conference. The back end of the defense is led by the preseason Mountain West Defensive POY, Andrew Wingard. Wingard enters his senior season as one of the most decorated Cowboys in recent memory. Wingard has already been named to the all-conference team 3 times in his career (2x 1st team, 1x 2nd team) and currently ranks 6th all time in school history with 367 tackles (record is 467) and he has been named to just about every award watch list he is eligible to win. He will lead a strong unit backed by talented guys like LB Logan Wilson, S Marcus Epps, and CB Antonio Hull. The hype around this defense is real. They are loaded, deep, and disciplined. They are good enough to keep Wyoming in every single game and should be better than last season, when they only gave up 30+ points once all year (Oregon). I fully expect a couple guys to break out this year and add their name to the list of notable players I mentioned already. Some candidates for breakout players are: CB CJ Coldon, CB Jalani Ellison, and LB Ryan Gatoloai-Fapula. Vander Waal, who red shirted last year, has been getting strong reviews since the spring and it says something that Bohl chose him to lead the offense over Smith. I realize Smith struggled last year when he filled in for Allen, but he does have 4 career starts and is a 5th year senior. It says a lot to me about Vander Waal’s ability that Bohl is choosing him over what might be the considered the safe, experienced choice. The offense is bringing back a lot of experience everywhere else and the skill positions should be improved. Bohl and his staff must like what they have seen in the running game, specifically senior Nico Evans, because they moved last years leading rusher, Trey Woods to defense. Woods flashed potential at times and appeared to have a bright future at the position but Evans has had a strong camp and freshmen Xazavian Valladay and Jevon Bigelow have emerged as candidates to get carries. I think a stronger running game, combined with experience at tight end with Austin Fort and Tyree Mayfield as well as receivers Austin Conway and James Price gives Vander Waal some weapons to get the job done. Don’t be surprised if the offense is better than last year despite the departure of Allen. My breakout candidate on offense outside of the freshmen running backs is WR Raghib Ismail Jr., whose dad was a standout at Notre Dame and finished second in the Heisman race in 1990. Austin Conway will have a big season. Junior wide receiver, Austin Conway is a weapon, specifically a Swiss Army knife. I expect Conway to have a monster season. He is coming off a 2017 where he lead the team in receptions last season with 62. He will be relied on heavily to make plays with CJ Johnson expected miss a significant amount of time with an ACL injury and James Price has gone through some injuries of his own. Conway presents a unique challenge for opposing defenses because he has the ability to beat you in 4 different ways. Over the past 2 seasons the former HS QB has caught 73 passes for 656 yards and 3 TD, run for 180 yards on 32 carries and 2 scores, completed 3 passes on 3 attempts with a touchdown pass, and he is arguably the most dynamic punt returner in the Mountain West. I only expect his numbers to go up and think he could get 10-12 touches a game. If Conway gets involved early, it will open a lot of options for the offense because of how much the defense has to key on him every single play. This is the year the Cowboys knock off a power 5 team. The Cowboys face two power five teams this year. They will host the Pac-12’s Washington State in their home opener (September 1st) and will travel to Columbia, MO on September 8th to take on Missouri, who plays in the SEC. During his time at NDSU, Bohl had a track record of knocking off P5 teams. His list includes Minnesota (twice), Kansas State, and Kansas as well as non P5’s Ball State, Central Michigan, and Colorado State. Overall his record against FBS competition at NDSU was 7-3. He hasn’t had the same kind of success against P5’s at Wyoming but he is now in his 5th year and this year he has 2 chances to do it. With this defense and the fact that Wazzu isn’t going to be Vander Waal’s first start should bode well for the Pokes. I like their chances in the home opener and wouldn’t be shocked if they won both. I definitely think this is the year the Cowboys properly welcome a P5 school to earth. Wyoming has had a nice run the last couple of seasons. A run that includes hosting a conference championship game, 2 bowl appearances, back to back 8 win seasons, and they are coming off a their first bowl win since 2009. There is no reason to think that the Cowboys’ run will end this year. As I have mentioned numerous times, they have an elite defense, I believe they have an elite head coach, and this team believes they can compete with anyone. I fully expect them to contend for a MW championship once again. They have a favorable schedule in the sense that they don’t play San Diego State and they are hosting Boise State. The Mountain division representative in the title game could very well come down to whoever comes out on top on September 29th when Boise visits Laramie. Best time of the year. Nothing gets me more ready and amped for Poke football than the 5 things I think. We may have lost JA but Craig bohl breeds NFL quarterbacks like an insurance agent sells insurance.